Snow can produce some wonderful photo opportunities, but only if your camera is at the ready. Having your camera available while you travel is rule number one. Great photo opportunities disappear so quickly if your camera is packed in your checked travel bag. If you don’t have room for your DSLR, at least always carry a quality point and shoot in your carry-on. Look around, photo opportunities probably abound. How about the schedule board? 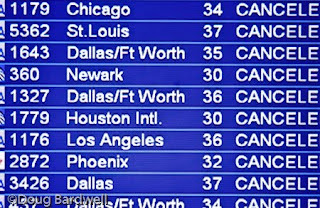 Nothing says “Won’t be home soon” like a picture of the schedule board with all flights canceled. If you are a people person, how about some shots of those long lines of kindred spirits waiting to have their flights rebooked or buying out the magazine stand. Photo tip….keep your distance as some of them might be a little grumpy. Be aware of your surroundings. I was sitting in an airport restaurant, when I began to notice flashing red lights revolving around the walls. Looking over my shoulder I could see the commotion was beginning to unfold right outside my window. There below me, an obviously distracted refueling truck driver had come a little too close to his intended target, and crushed his truck’s roof as he drove into an awaiting airplane. Look also for travel photo opportunities shooting photographs of the deicing experience. With the long-armed, monsterish looking machinery and the rising mist from their hoses, again, you can bring back some interesting photos.